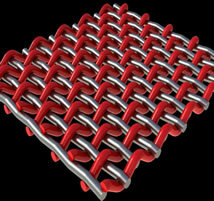 This allows UTZ to give our customers the perfect mesh choice for their specific applications. Polyester border surrounding Stainless Steel square for the most demanding of print runs. Due to the nature of the spring in the polyester when matching the stainless steel and polyester mesh the results are the BEST possible screen printing option. The polyester absorbs most of the shock from off contact printing and the stainless steel keeps its rigidity about 30% longer than an all stainless screen. 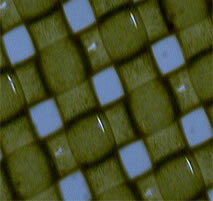 This process is usually reserved for High end electronics, ceramics and solar cell printing. and can improve efficiency of your screen manufacturing practice by lowering exposure times by 50% in comparison to a Dual Cure Emulsion. printing and features very good line definition and Solvent resistance. are looking for high quality and durable screens for long print runs. The capillary film emulsion is specifically formulated for the best printed results due to its extremly low RZ rating and its unparalleled gasketing to the substrate. 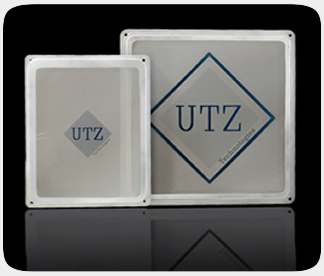 Capillary film is not as durable as directly coated emulsion so it may lack the durability you need through a long print run, however UTZ uses proprietary film attachment processes to yield the best possible result. The best of the best. The Micro emulsion has set the new standard in Fine Line Printing Emulsions with extremely small particle sizes and excellent solvent resistance geared toward the Solar industry. Micro Emulsion is capable of 20um lines and spaces with +/‐3um tolerance on line width as long as appropriate mesh selection and angle are chosen.